As a bit of trivia, where did sushi come from? Was it from Japan? I was surprised to learn that the earliest traces of rice and fish was discovered by Japanese researchers in Southeast Asia. The earliest fossil evidence, according to one story I've heard, was discovered on the island of Borneo in Southeast Asia. Borneo is part of Malaysia, made infamous now by the mysterious loss of flight MH370. Even though I've spent the last 3 decades living the US, I was born in Malaysia. So it's fitting that I combine my love for American barbecue with some sushi ideas that hail from Japan via the island of Borneo which today is shared with Malaysia and Indonesia. In Los Angeles, we have sushi restaurants seemingly on every corner. My small city alone has over ten Japanese restaurants so enjoying a California sushi roll is easier than finding a burger at McDonalds. There's a dizzying range of progeny of the California Roll which was born here in the early 1960's by a Japanese sushi chef Mashita who left Japan to find his fortune it the City of Angeles. 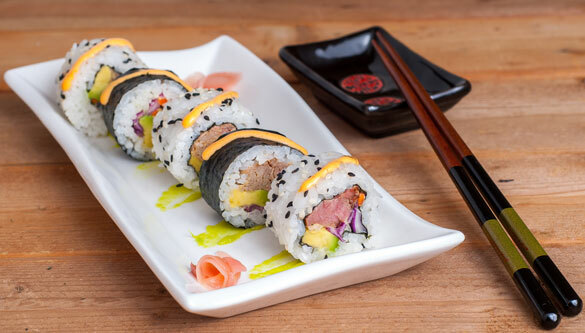 There are dozens of variations of California rolls with names such as Caterpillar roll, Crunch roll, and Rainbow Roll. And I've seen the reverse import of this "fusion" style back to Japan where the ubiquitous California roll has even influenced traditional Japanese roll making. I've combined elements of American barbecue such as pulled pork and coleslaw into a simple East meets West pulled pork roll. I always have leftover cooked pulled pork and coleslaw in my fridge. I used purple cabbage this time to add a bit of color to my roll. Try to find a Haas avocado as I think it tastes better and is worth the price. The Haas avocado is packed with good oils for your health and was originally the substitute for fatty tuna in the roll. You can roll the sushi inside-out or outside-in depending on your preference as some folks prefer the nori seaweed on the inside. I like my rolls spicy and creamy so I made a Sriracha mayo drizzle dressing (Sriracha is also another Los Angeles invention) . 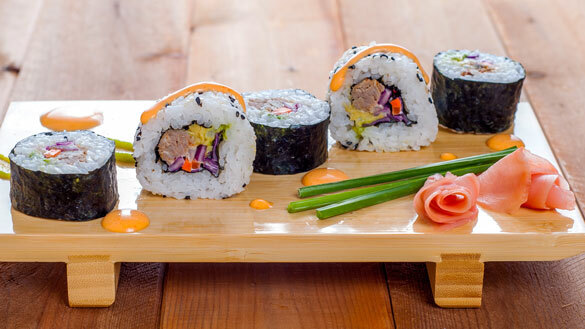 Be sure to buy short-grain sushi rice as it has the right amount of stickiness. The regular long-grain rice (Mahatma, Jasmine, etc.) will not work. When you work with the sushi rice, be sure to wet your hands so the rice does not stick to your fingers. Use plastic wrap or a gallon plastic bag to cover your bamboo mat so it's easier to clean up after you're done. 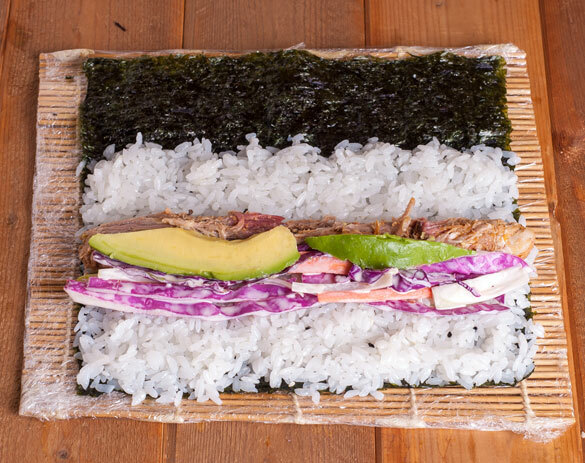 Don't have a bamboo sushi mat? Try using thick construction paper covered in plastic wrap as a MacGyver substitute. If you're a beginner to rolling sushi, you can cut your rolls with the plastic wrap still on and then remove the wrap before serving. This will minimize the rice falling apart if you did not cook the rice perfectly to get the right amount of stickiness. Leave the roll in the fridge for 20 mins if it looks like your roll is falling apart. If the rice is fine, you can cut right away. As always, use a very sharp knife and dampen your knife with water so it glides through the roll. If your roll is not cutting properly, try to wipe your knife down with a damp cloth after each cut. 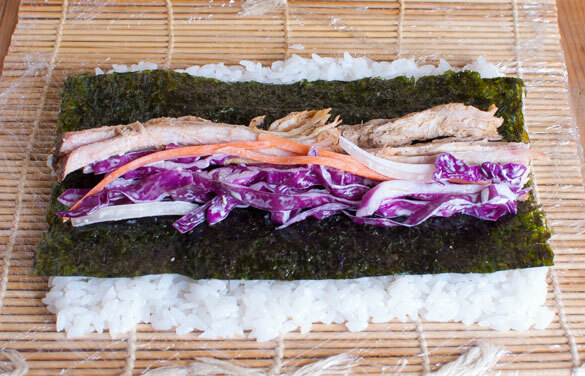 For those who don't care for the taste of seaweed, you can use Soy Paper or Rice Paper instead. 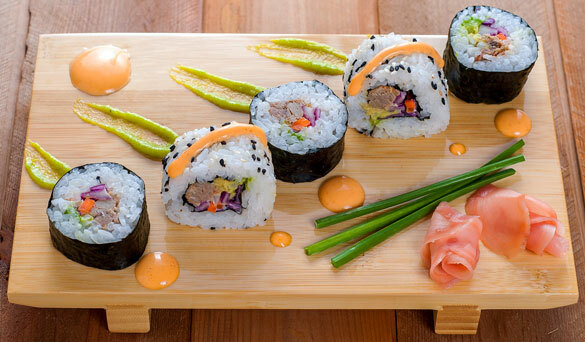 Read on if you'd like to learn how to make this barbecue-inspired California roll. Combine the mayo, srirachi & lime juice in a bowl with a whisk. In a sauce pan add the rice vinegar, sugar and salt and heat up until combined, then cover. For the sushi rice, rinse it and let it rest in fine screen colander for 5 minutes. Then pour the wet drained rice into a pan and add the water. Bring to a boil on high then reduce to low to medium low and cover. Cook for 10 minutes. Do not take the lid off but move off the hot burner to a cool burner and wait 10 more minutes. Take the lid off and combine the sushi rice dressing with the rice in a large bowl while fanning so the rice doesn’t continue to cook. Set aside (for an authentic touch, use a Japanese hand fan to cool your rice while you stir with a genuine bamboo spatula. With wet hands take a large ball of rice and spread out onto the bamboo mat directly over the plastic wrap. 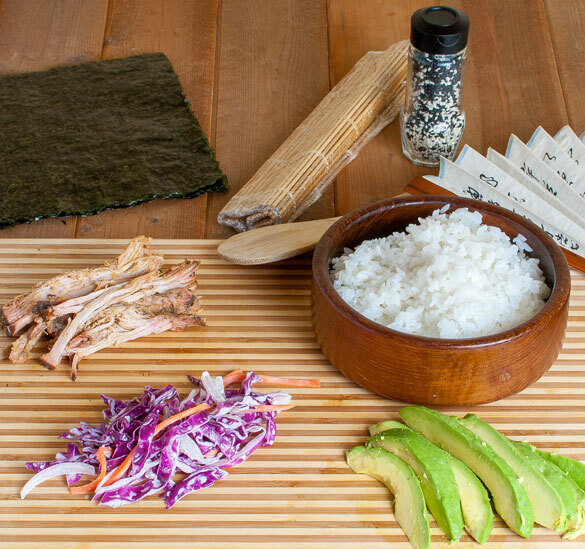 Spread it the width of the cut in half nori sheet and extend the rice pad ½ inch past each edge of the nori. 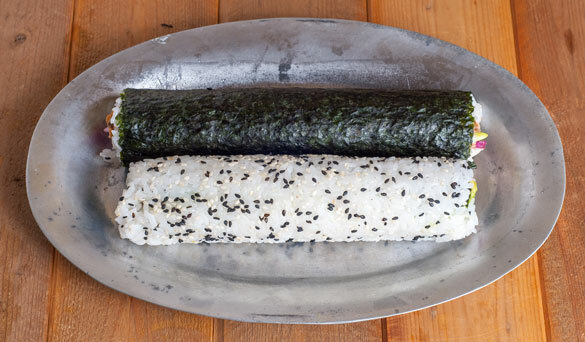 Lay the nori sheet in the middle (should be about the same width as the rice and ½” margins on the front & back edges). Roll the mat and have the two rice margins meet. 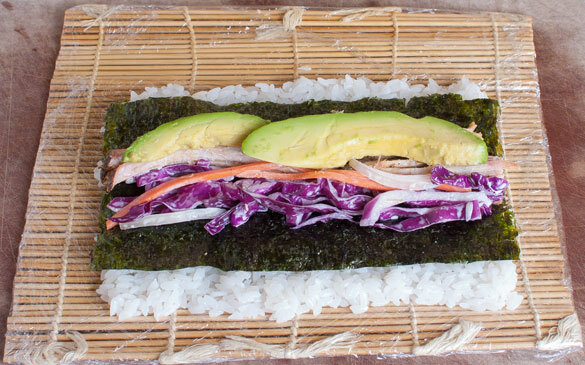 Use the mat to roll the sushi roll into a nice round shape. Open the mat up and sprinkle sesame seeds all over the surface of the roll. Then re-roll with the mat pressing in the seeds. Refrigerate for 20 minutes or so covered in plastic wrap. With wet hands take a large ball of rice and spread it out onto the nori edge to edge and from the bottom to about ¾ths of the way up. Add the pork, coleslaw and avocado as instructed in the California Roll directions. After refrigerated and cold (this helps for making cleaner cuts), optionally reform in the bamboo mat if needed. Then cut the roll in half, then each half into thirds (making 6 nicely cut pieces per roll). Clean the knife with water—and dry it off with a towel–between each cut to rinse off the sticky rice for cleaner cuts. Arrange the sushi slices, wasabi paste and pickled ginger on a plate to your liking. Drizzle the Sriracha mayo sauce over the sushi rolls. Serve with soy sauce and a pair of chopsticks (or a fork if you’re chopstick-challenged). Lay the nori sheet in the middle (should be about the same width as the rice and 1/2” margins on the front & back edges). Lay down the pork (about the thickness of an imitation crab stick), then lay down the coleslaw. Finally lay avocado slices over them both. With wet hands take a large ball of rice and spread it out onto the nori edge to edge and from the bottom to about 3/4ths of the way up. Refrigerate 20 minutes covered in plastic wrap. What a cute idea! I mean meat + rice is never a bad idea, right? 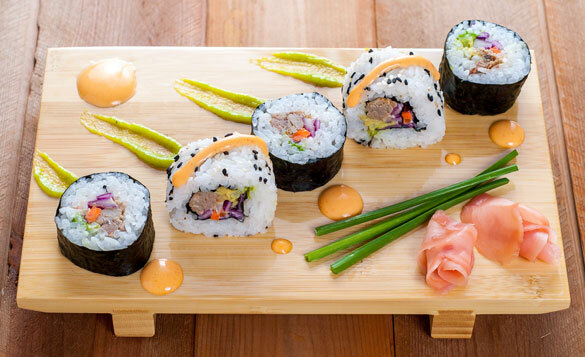 The sushi roll just makes the process of stuffing your face more efficient hahah – thanks for the recipe! We’ll definitely going to check out all your bbq reccipes! No maki roll is safe from Harry as I’ll find a way to get barbecue into sushi rolls! LOL!